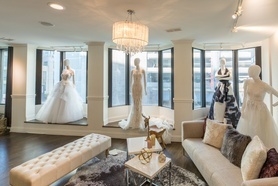 While many brides travel to the fashion capitals of the country – New York City and Los Angeles – to find their dream wedding dresses, there are plenty of wedding salons across the country that scour the bridal runway to find the most on-trend and timeless bridal gowns from exceptional designers. Each collection of wedding dresses offers something new and exciting for brides that want to wear the latest gown from the runway and those that prefer a more classic look. 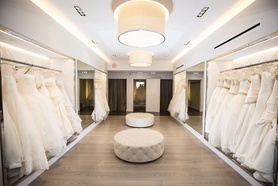 Once you’ve scoured the inspiration galleries on InsideWeddings.com for the dress styles and designers that interest you most, it’s time to book an appointment at a bridal salon near you. 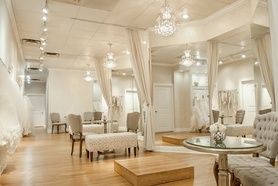 Use our vendor directory to find a wedding salon that fits your taste and budget. We encourage brides to read reviews from other women who have shopped at these stores to determine if it’s right for you. Once you have your initial appointment booked, invite your bridesmaids and the mother of the bride to attend the appointment with you. While ultimately you’ll be choosing the wedding dress that makes you feel the most like a princess, it’s important to have a group of your favorite people there with you for support and encouragement. 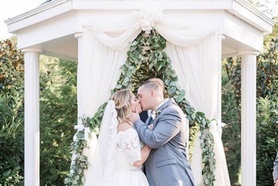 The staff at the best bridal salons are knowledgeable and will help you find the right wedding dress for your silhouette, while also staying true to your vision. 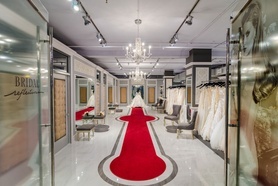 Once you find “the one,” you’ll work with the wedding salon to get alterations, schedule fittings, and perhaps even purchase additional wedding accessories, bridesmaid dresses, and attire for the groom and groomsmen. 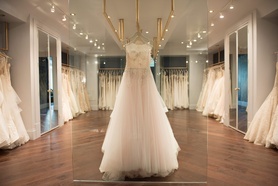 Looking for flower girl dresses or ring bearer attire? Some wedding salons also stock this type of attire. Just find a salon you like and give them a call, send them an email, or use the Inside Weddings chat function to get immediate access to your favorite bridal salons in your city.